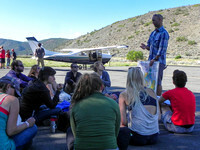 In late July 2012, students from University of Colorado, Boulder INVST Community Leadership Program took part in EcoFlight's Kestrel Program on natural gas leases in the Thompson Divide in Colorado. Much of the land west of the Crystal River and north of McClure Pass has already been leased to natural gas drilling, with 81 leases covering approximately 105,000 acres. Together with the Wilderness Workshop and the newly appointed Executive Director of the Thompson Divide Coalition, the students flew over the Thompson Divide area to see for themselves where efforts are being made to protect the Thompson and Divide Creek watersheds from potential oil and gas drilling. The Kestrel Program was particularly timely as a Houston-based oil and gas company, SG Interests, is preparing to apply for permits to drill wells on thousands of acres in the Thompson Divide. The Thompson Divide offers the local ranching community a way of life, recreation opportunities to support the local tourism industry, provides clean air and water, and is home to important wildlife habitat and migration corridors. We then flew out toward the Roan Plateau to see where energy development is already taking place. Over half of the Roan Plateau Planning Area is either owned outright or leased by oil and gas companies, and intensive oil and gas development is currently taking place at the base and on the western one-third of the top of the plateau. Watch this video to hear Colorado University students speak their opinions about drilling on Thompson Divide! EcoFlight Student Program - Colorado's Thompson Divide from EcoFlight on Vimeo.